CD-2 sports the monaural recording of the Richmond show on March 18, just 2 days before the main concert. Previously released on FTD's 48 Hours To Memphis. Strange choice. 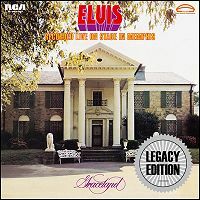 Coupling it with the better recording of Elvis' very first show in Memphis for many years, the one on March 16, would have made so much (more) sense. The interesting bit, however, is that the same guys that mixed Elvis At Stax, have re-mixed and mastered the main concert. For the first time - it is presented with the respect it deserves!